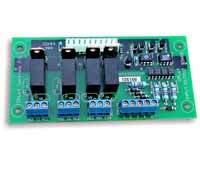 These boards extend the functionality of existing inputs or outputs on SPLat boards. Note: These boards do not increase the number of I/O points, they simply add to the capabilities of existing points. Adds relays to 8 existing solid state outputs as found on virtually all SPLat standard controllers. Adds relay capability to 4 outputs and adds opto-isolation to 4 inputs.